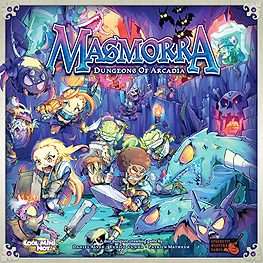 Masmorra: Dungeons of Arcadia is a fast-paced, dice-driven dungeon crawl board game set in the Arcadia Quest universe. Players control Heroes as they explore three levels of a randomly generated dungeon full of monsters, traps and treasures! Countless surprises, like bosses and special rooms, await the Heroes of Masmorra, but only one Hero can be the first to reach the final level and become the undisputed champion of the realm! In Masmorra, players roll and re-roll a pool of dice that guide their actions for their turn. A unique dungeon is created as players explore and lay down tiles while fighting off monsters that are represented by special dice! But players must also be aware of opponents' Heroes, as they'll be able to use cards to disrupt other Heroes' carefully laid plans!